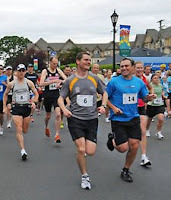 After a great warm-up, I took the start line of the Oak Bay Half Marathon. The year prior, this was probably on of my best races, as I ran strong from beginning to end, and finished sub 1:25. Therefore, in order to better that result, I would need a very special day. The night before, I had a dream that I ran extremely well, and posted a 1:23 clocking, so I actually went into this race feeling that it was possible. As the race started, I felt loose and as always, I just wanted to make sure that I started conservatively. And I did. I let the relay guys speed ahead, and I nailed my first couple K's right where I needed to. It was about that time that Gary Duncan passed me, and this had just become a phenomanon that I was now expecting, as it happened every single time. After the first 10k, I was right at 42 minutes. This was about a minute slower than what I wanted, but I still felt like I could get a second wind on the way back, and hammer it home for a new PB. 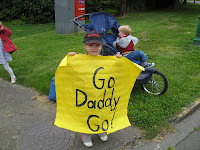 At the 12k mark, I passed my family, and it was totally exciting to see them holding a "Go Daddy Go" sign. This kept me inspired, or at least, for a while. As I rounded the turn-around, I could feel the jump in my legs seeping out. I knew unless that second wind came quickly, it was not going to be my day. For much of the way back to the finish line, I was alone in my running, which definitely did not help things. With nobody to push me, and with my legs starting to feel some residual fatigue from my training runs, it was not a superb finish. As I made my way up the last hill, I could see my watch read the finishing time I got last year. I was close, but not close enough. In the end, I finished with a time of 1:27:39. It was not a superb time, but it was definitely decent. When you consider that the North Coast Trail was done two weeks prior, it was a sound result. A 17th place finish was a fitting result for me. The highlight for me this day, however, would come shortly after. We entered Teagan in the 1k Kids Krazy Kilometre, and she loved it. How proud I was to see her in her first race. She did well, and loved every second of it. I think her mum and dad were more excited than she was. At the end of the race, all the kids got a finishing medal. Teagan would wear the medal solid for the next two weeks, and even to bed.